Batman has some of the greatest gadgets in the game. So, it's not so great when his enemies get a hold of them. 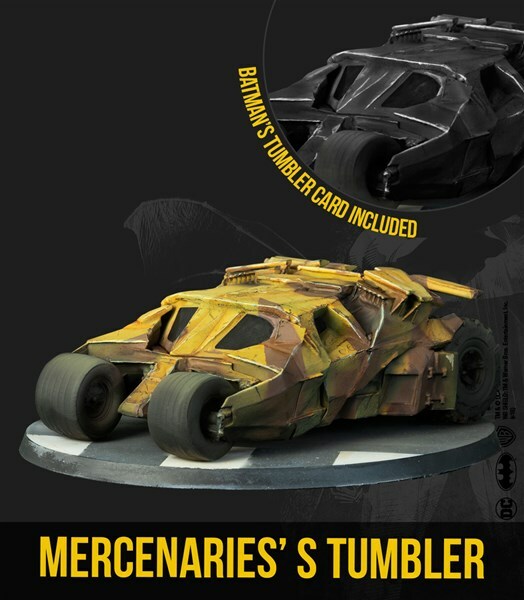 Take, for example, the Tumbler, the tank-like version of the Batmobile from the Dark Knight series. Bane and his gang managed to snag a few, and they'll be bringing them to the streets in the Batman Miniatures Game from Knight Models. Have yourself a look. In The Dark Knight Rises, Bane has already set his base below the Applied Science division of the Wayne Enterprises. From the very beginning Bane has planned to get the Wayne Industries resources. When Bane and his soldiers detonate a device beneath Wayne Enterprises’ Applied Sciences Division, they make off with three Tumblers left in storage. These prototypes are equipped with retractable dual-barreled cannons and a multiple-tube missile launcher. Get your BMG The Dark Knight Rises box, and take a ride in your own batmobile by Gotham streets!